Last fall I was invited to come down to California and tour the Muir Glen farms and facilities. Now I have to admit, when they first reached out I had no clue of what this trip would be about, and whether or not I would even like it. So I said yes, as I do like their products, packed my bags and off I went. I arrived to meet a handful of other bloggers who I adore. We loaded up on the bus and headed out to one of the farms. Now let me just say, it was 106 degrees, and this PNW girl was overwhelmingly hot. But then we arrived to the farm, where we were able to walk through the fields, sampling the tomatoes and learn about the process of growing, picking, and transporting tomatoes. It was extremely fascinating, and the tomatoes were exactly how they were suppose to be, packed full of flavor, not like the tomatoes we find in the grocery stores. Throughout the rest of the trip we toured the facility where they receive the tomatoes, process and can them. Already a fan of their Fire Roasted Whole Tomatoes, I loved watching the tomatoes come down the line and get fire roasted until nice and blackened. The trip ended with me having a different look on canned goods. Since then, we have been eating our fair share of canned tomatoes over this winter. That doesn’t mean that come summer I am not thrilled for fresh tomatoes, because nothing can beat that. But during these colder months, I love using Muir Glen’s Whole Tomatoes for sauces and especially for slow cooking. This recipe is a combination of all things that I love. Slow cooked pork until tender, mixed in with tomatoes, onions and herbs. Served over fried cornbread and topped with creme fraiche and a good portion of fresh parsley. This works great for dinner, served along with a salad. But it also is really fun for appetizers. Just simply cut the cornbread smaller. 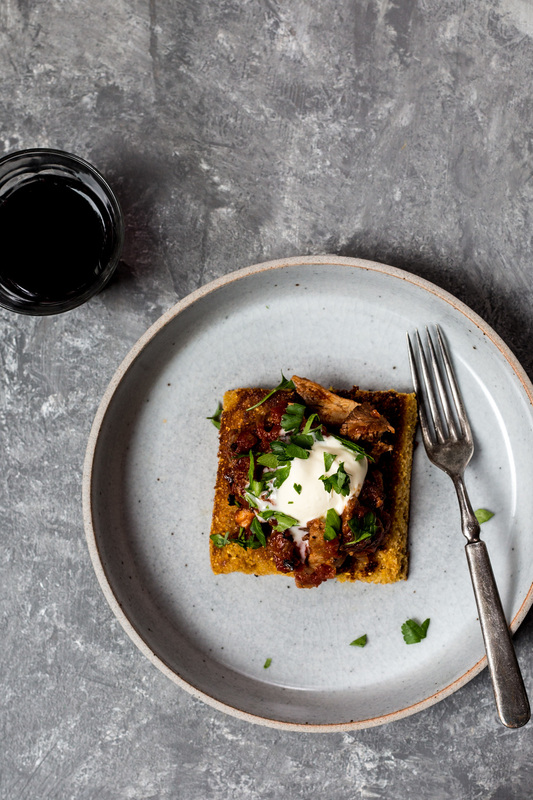 And if cornbread isn’t your thing, or just simply to try something different, this pork ragu goes nice over polenta with parmesan. This post was sponsored by Muir Glen. Thank you for supporting my sponsored recipes, enjoy! Season pork with a few good pinches of kosher salt and pepper. Using a large heavy dutch oven, add vegetable oil and cook over medium-high heat. Add pork and sear on all sides. You want a good crisp brown coating all around. Transfer to a plate and set aside. Lower the temperature to medium and add the garlic and onion. Cook, stirring occasionally until caramelized, about 15 minutes. Add the tomato paste and cook for another 5 minutes. Add the wine, if using, and let cook down, another 5 minutes. Stir in the Fire Roasted Whole Tomatoes, making sure to crush them with a wooden spoon, or even your hand. Toss in the herbs and bay leaves, add 2 1/2 cups of water, return the pork to the pot and season with salt and pepper. Raise the heat back to medium-high, bringing to a boil, then reduce the heat and simmer for 3 hours. You want the sauce to have thickened and the meat to be tender and falling apart. If you are not able to completely shred the pork in the dutch oven, simply remove it and place it on a cutting board, using 2 forks to shred. Once shredded add back to the pot and stir together. Preheat the oven to 425 degrees and grease an 8” baking dish. Mix together cornmeal, flour, sugar, baking powder, baking soda and salt in a large bowl and set aside. Mix together the eggs, buttermilk and melted butter in a small bowl. Add the wet mixture to the dry mixture and gently fold together, trying to not over-mix. Pour the batter into the baking dish and bake for 20 minutes until golden. Let cool for 15 minutes before cutting into squares. Place a large skillet over medium-high heat, add olive oil. Add cornbread squares to the skillet and cook for 2-4 minutes on each side until golden. If they begin to brown too quickly, turn the heat down to medium. Set the fried cornbread aside and continue until all squares are done. 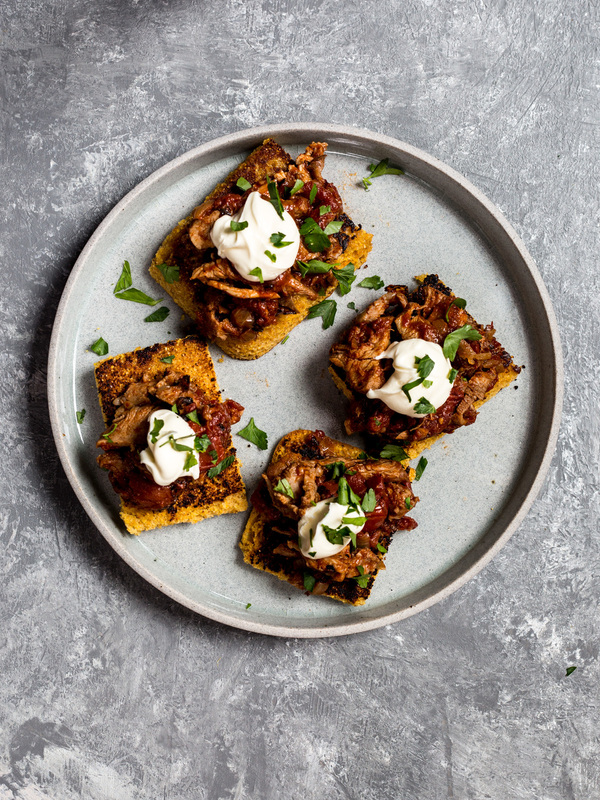 To serve, use a slotted spoon and place a large spoonful of the pork ragu over the fried cornbread. Top with a dollop of creme fraiche and a sprinkle of chopped parsley.